I know this place. I remember the many days along the edges of the Kyle. I remember scrambling at low tide to the feathery eider nests on Talmine Island while nervous mothers sat tight; the night a pod of dolphins performed aquatic ballet in Tongue Bay, between Midtown and Scullomie; the dunes as high as water towers with sand so soft you could run down their steep faces, safe in the arms of gravity; the day on Rabbit Islands in the company of seals and the nervous wait on the shore – would the fisherman remember us; spinning off the rocks near the causeway as oystercatchers, in faithful pairs, skimmed the fast running tide near inquisitive selkies, heads bobbing in the water, watching our every move; the sad sight of the lone grebe, too exhausted to fly from its watery grave beneath Ard Skinid; the evening walks to the little that remained of Port Vasgo and the abandoned boats along the shoreline at Talmine; the busy otter, scurrying across the sands at low tide beneath Tongue Lodge, late, so late for a very important date; catching a first brown trout on Loch a Mhuilinn – a fish so young, it knew no better than to rise to my inexpert fly; always, a harem of seals sunning on the sandbar. All this, and the reminder of how fragile we are – the beautifully sculpted, poignant headstone at Melness cemetery. The young man had memories like mine and more. Staying out too long for one last cast across inhospitable waters, he never made landfall again. 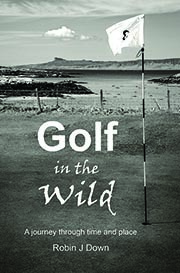 The text is an extract from Golf in the Wild – Going Home – the sequel to the first book. (as most will know, the film excerpts are from Local Hero – the appearance of the helicopter, like a rising moon, and its subsequent arrival on the beach at Camusdarach is one of cinema’s great moments). Wonderful ‘sense of place,’ Robin. Thanks Jean – it is an ‘undiscovered’ part of Scotland and long may it remain so. Love the prose and I was really moved by that first image. Wonderful. Beautiful, atmospheric words, Robin. Now I feel as if I know this place, too. Many thanks for your ever-generous support, Julie. I recommend a trip up there one day – it is a wonderful place. Just catching up and so enjoyed reading this. Bodes well for the follow up book! We too know this place so well. Bucketfuls of memories from almost 50 years of spending time together in that wonderful part of the far north. A special place – sadly now becoming over run by speeding cars / motorbikes and other such racers, frantically doing the latest ‘must do’ route being promoted by tourism powers that be in Scotlland. Thankfully, some of us still know of secret, beautiful, quiet places up there, where we can take time to enjoy it and appreciate it properly. There are some fascinating graveyards up there, all well worth a visit, and with so many stories to tell. I have yet to experience the impact of the North Coast 500 – it’s always a shame when secret places are exposed. I guess it might do something for the B&Bs but mostly it will be drivers/riders rushing through. I have now got stuck researching the graveyard at Skerray – another wonderful location, off the beaten track. Just booked a week in Orkney at the end of April so not too long before we head to the far north again. The Skerray graveyard – do you mean the one overlooking Torrisdale beach? This one is a favourite for a wander with some really interesting gravestones. Folks that died in the Titanic disaster; a mother and her daughters , on their way home to Scotland, lost when the boat was sunk at the start of WW2; and many more. I am sure I have notes, and photos, still in a box! That’s the one, Gillean. I remember it as the final resting place for Donaldina, Hughina, Angusina et al. I will email you on the topic soon.